Tory: As soon as this boxed set arrived we ripped it open to start watching! The first thing I need to say is that this is one good looking set. The booklet style of holding the DVDs and the photography within would make it the best-looking presentation of a DVD that I have ever seen (thus far – no lie!). This boxed set holds within all three series of LoG and also the Christmas special. If you consider yourself a fan of the series, you really need to buy this asap or hint yourself silly in getting it for Xmas. "A word of warning... if you are not a local, steer clear of the Local Shop of Royston Vasey!" The League of Gentlemen, an extremely black comedy that is based in the fictional isolated town of Royston Vasey finally arrives on DVD to the cheers of fans or for those seeking a darker side to their order of comedy. Easily one of the most ingenious comedy series of all time, The League of Gentlemen is played by three extremely talented actors (Mark Gatiss, Steve Pemberton and Reece Shearsmith) who play every major role in each episode. The characters themselves are extremely disturbing and appear to each have a mental illness not to mention that there appearances are quite grotesque. The first episode (entitled "Welcome to Royston Vasey") introduces viewers to this bizarre English town when one of the towns former inhabitants, Benjamin Denton arrives home to meet a few of his friends for a hiking weekend. Dropped off at his uncle and aunts home by Babs the preoperative transsexual cab driver, his weekend soon turns into a strange experience that lets viewers know why he left this isolated town in the first place. Whether it's the twisted inbred sadomasochists urine infested local shop owners Edward and Tubbs Tattysrup, the Dentons and their toad collection or the lovely Babs, the transsexual cabby, there is a character for everyone in this strange series. The series plays like a horror sitcom and as the episodes progress, viewers are slowly introduced to more characters and the inner workings of Royston Vasey. The DVD is also littered with extras that include an audio-commentary by the cast and how they developed these strange and wonderful characters from initial character development to early stage performances. Not to mention various character biographies, a photo gallery and 20 minutes of unseen material that include a plethora of outtakes. The video quality of The League of Gentlemen Series 1 is flawless and contains a 16:9 aspect ratio that even though it is an extremely dark comedy, contains some exceptional picture quality and extremely sharp colours. The only downside is that there is occasional artefacting throughout the series but unfortunately this happens rarely. 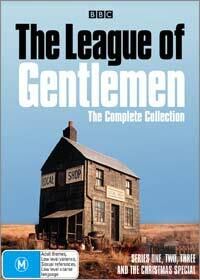 The League of Gentlemen the entire first series contains Dolby Digital 2.0 and is extremely clear and audible. Add a beautifully created music score by composer John Talbot and you have a match made in comedy horror heaven. This comedy may not be for everyone but if you are looking for something different on your comedy menu, then The League of Gentlemen may very well be for you. The cult hit "The League of Gentlemen" returns with the complete second series of this unusual black comedy. As with the previous season, the series is based in the isolated town of Royston Vasey where nothing is what it seems. In order for the creators to keep the series fresh and interesting, they have introduced a variety of new characters such as Papa Lazarou (who "guest starred" from season one), the bizarre Herr Lipp and the Mayor of Royston Vasey. Fortunately the creators have also kept our old favourites such as the Dentons and Mr. Chinnery to name a few. The episodes have taken a darker twist since the first series (if that is possible) as the first episodes starts with a visit from Papa Lazarou and his circus that leads to one of the funniest nose bleeds in history as just about everyone in Royston Vasey unexpectedly gets a nose bleed. When the scariest freaks in the world (Papa Lazarou's circus) is scared by the denizens of Royson Vasey, then you know something is extremely messed up in this town. The comedy of The League of Gentlemen is at the best of times extremely weird and is probably not suited to lovers of mainstream comedy. I loved the first season of this strange black comedy but I found that season two was generally a hit and miss. It appears that the creators have tried to outdo themselves and unfortunately it didn't work too well. Don't get me wrong, the show still had me in stitched but these were too far and thin. To those that have never seen the League of Gentlemen, the main characters in the town are played by three extremely talented actors, Mark Gatiss, Steve Pemberton and Reece Shearsmith. As with the previous DVD collection, the series also contains some hilarious extras that include character biographies, cast commentary, a photo gallery and over 20 minutes of unseen footage that must be seen to be appreciated. The video quality of The League of Gentlemen the entire second series is once against flawless and is shown in a 16:9 aspect ratio with exceptionally clear and colourful picture quality. Unlike the previous season, I found no traces of artefacting or any other DVD errors. The audio quality of the disc, although using Dolby Digital 2.0 has been perfectly transferred to DVD without any problems such as lip syncing. For a television made series, it comes across exceptionally clear and add the music from John Talbot and you have a perfect addition to this strange black comedy. As stated in the first season review, this comedy may not be for everyone but if you are looking for something different on your comedy menu, then The League of Gentlemen may very well be for you. Uh oh... those crazy residents from Royston Valley have returned and if you thought series 1 and 2 were outrageous, then wait till you watch this current incarnation. As with the previous series, three talented actors (Mark Gatiss, Steve Pemberton and Reece Shearsmith) play almost the entire population of Royston Valley with their acting chores divided equally amongst themselves. Although all three actors help with the writing and scripting of the series, there is one more writer who has remains largely absent from the ensemble as he prefers to remain anonymous... or his acting abilities are too poor. For those that have never watched the series, the series is based in a remote fictional English town called Royston Valley that contains the strangest denizens of the United Kingdom. Many of the old inhabitants make a welcomed return in series 3 such as the sadomasochists local shop owners Edward and Tubbs Tattysrup with a variety of extremely entertaining and disturbing new comers. As each series of the League of Gentlemen progresses, the writers just get more and more bizarre and probably two of the most enjoyable episodes was episode one when the extremely repulsive Pauline discovers she is pregnant and episode 5 that has Charlie and Judy open a massage parlour called Spit and Polish. It should also be noted that this series is indeed black comedy and people who are easily upset or disgusted should shy away from this disturbing yet entertaining series. As with the previous series, the comedy of the League of Gentlemen goes up and down from moments of side-splitting laughter to a few chuckles here and there. The video quality of the disc is presented in a ratio 1.78:1 with above average picture quality. The images are sharp, with the colours being vibrant and bright. Apart from that, there were no major DVD errors that I noticed during the viewing of this series. The audio quality is presented in Dolby Digital 2.0 stereo and the audio sounds extremely clear and audible. Once again Joby Talbot lends his musical talents to the main theme of the series that really gives me the creeps during the introduction of each episode. Talbot also composes the music during the episodes with his unique style of music that goes hand in hand with the humour of this series. The League of Gentlemen series 3 contains some of the most hilarious extras that I have seen in a long time that include audio commentary for each episode, Easter eggs, deleted scenes and an in-depth interview with costume designer Yves Barre. This series may not be for everyone but if you are after pure British comedy without the taste of America than I would recommend you hire or buy this series. The comedy is indeed black but was extremely entertaining for this viewer. And to round off the equation we have the Christmas special that really has to be seen to be believed. I really don’t want to spoil too much here but the series is well worth the watch and the Christmas special is the icing on the cake. Add to that the extras that are on the disc and you have yourself a boxed set that simply is too delicious to be ignored.